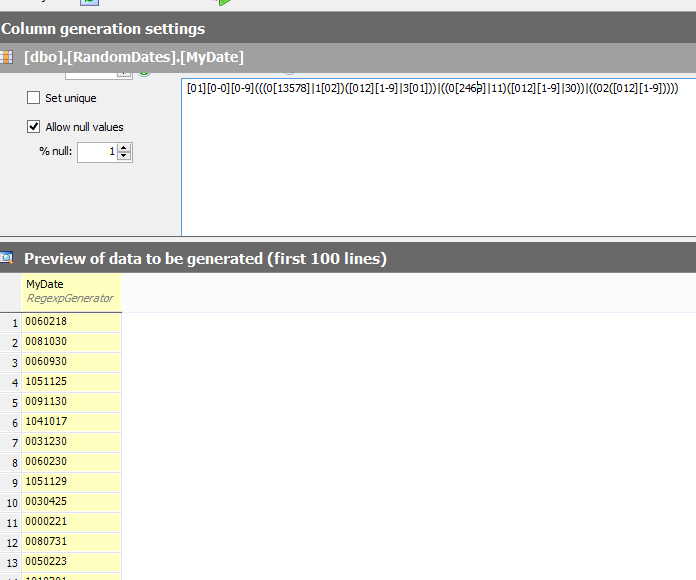 This is a series on SQL Data Generator, covering some interesting scenarios I’ve run into. 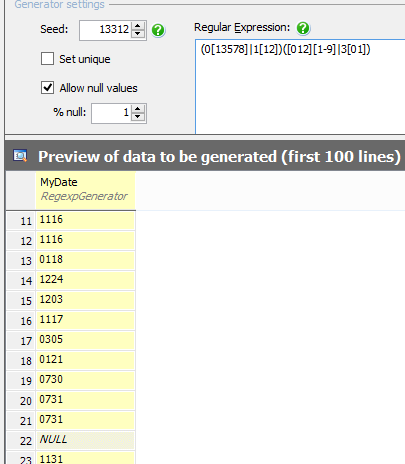 If you’ve never tried it, SQL Data Generator is a part of the SQL Toolbelt. Give it a try today with an evaluation today. 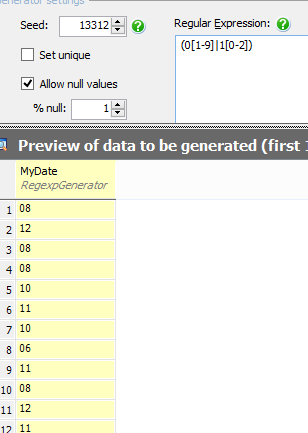 Recently I was working on transforming some dates, and wanted to generate a large n number of dates for testing. 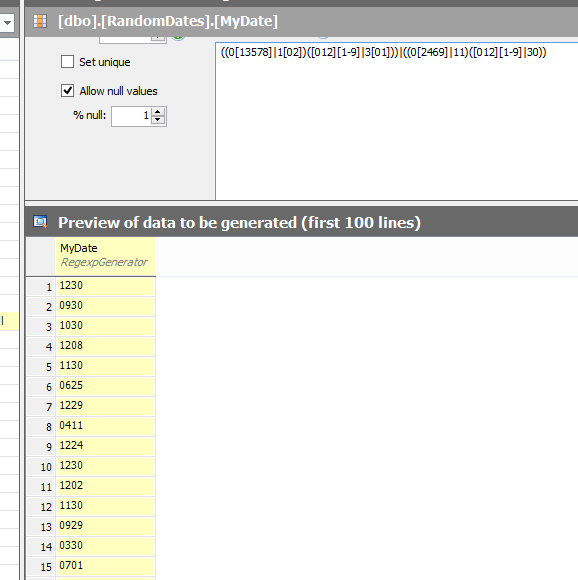 I decided to use SQL Data Generator, and a little RegEx to meet my needs. The format I needed was CYYMMDD, which is the century as a 0 or 1 (1900 or 2000) and then the yymmdd format. While there are some pre-made expressions to build dates, there wasn’t an easy one to handle the century like this. 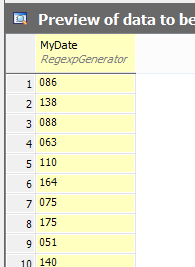 I could have used a date expression in T-SQL and randomly allocated a century, but I decided to play around with RegEx. However that causes issues when I get to the month. I need a two digit month, but I can’t have some combinations of two digits. If I were to write [1-9], I’d get months like 18, which aren’t valid. Instead, I need a pattern that only matches a 0 with 1 to 9, and only allows a 1 with a 1 or 2. This says that if we match the first half (before the pipe), then we literally have a 0 there, with a second character in the range 1-9. That gives us 01 to 09. The second half, after the pipe, does the same thing, but it matches a literal “1”, and then a 0, 1, or 2. As you can see, I have random months (only showing this expression). Now the hard part: days. Days are strange in the calendar because the possible days depend on the months. Years and months are consistently in ranges, but the days are not. Let’s start with the most common days: 31. That gets me almost all the months. The last part of February, the hardest. Now I could worry about leap years, but I’m not going to. Proper handling here means verifying the year (and century here) and doing math to ensure a leap year is viable. Instead, I’m going to just ignore the 30s and manage days 1 to 29. Now I have a nice set of random dates if I put everything together. I leaned on a few examples to decode a few of the expressions and also to check that I wasn’t messing up. 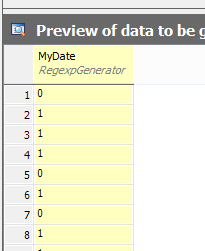 This entry was posted in Blog and tagged Data Generator, Redgate, RegEx, syndicated. Bookmark the permalink.